Star Trek Online gibt es seit einigen Monaten auch für die Playstation 4 und Xbox One als Free2Play Titel zu spielen. 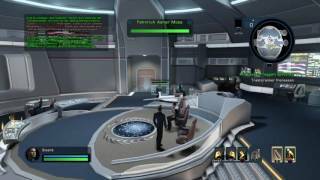 Hier wird die erste Stunde in der Online Kampagne von Star Trek Online auf der Playstation 4 gezeigt, gespielt wird auf der Seite der Förderation gespielt. 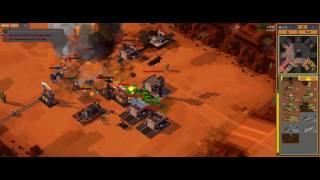 Long did I have to wait for a new real time strategy titel, as I am a huge ‚Command & Conquer‚ fan. The surprise was big when ‚Petroglyph‘ anounced their newest masterpiece ‚8-Bit Armies‚. Of course, my curiosity was piqued and so I took a closer look at the game. 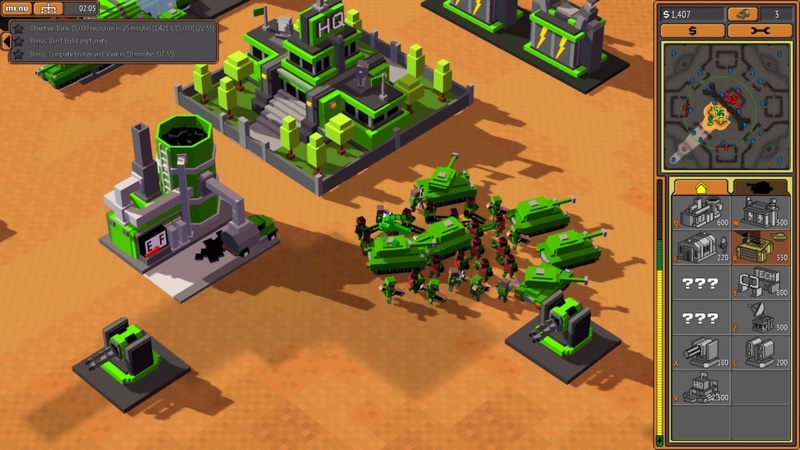 Needless to say, ‚8-Bit Armies‚ is not ‚Command & Conquer‘, but it is really similar to that franchise and might espacially appeal ‚Command & Conquer‘ fans who were abandoned by ‚Electronic Arts‘. Due to the rather manageable variety of units and structures the player can produce, ‚8-Bit Armies‚ is particularly suited for beginners. Though new factions will be added, the game is going to remain manageable. 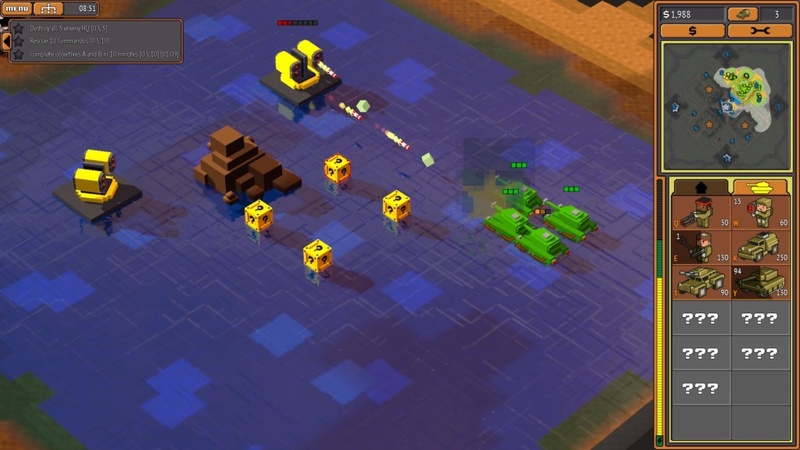 ‚Petroglyph‘ offers ‚8-Bit Armies‚, which comes with about 25 single player and 19 coop missions as well as a multi player mode and a neat toy blocks look, for only around 15€ on ‚STEAM‚. In multi player and skirmish modes, there are approximately ten maps availeable where up to eight human or AI players can partake. 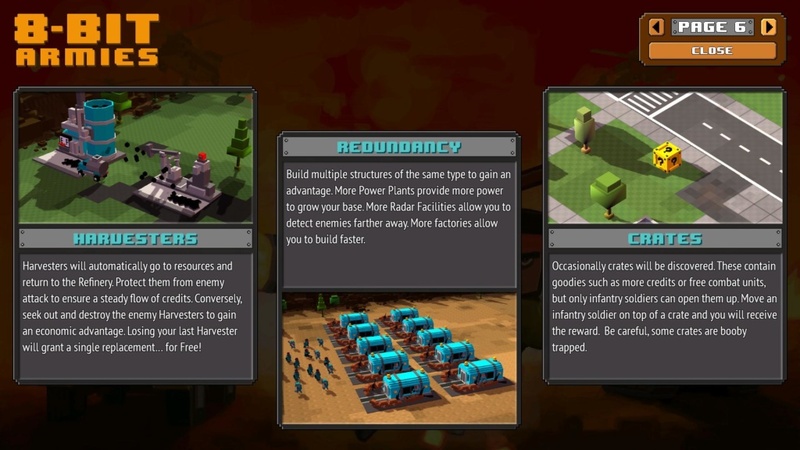 Like in ‚Command & Conquer‚, you can build your base from an HQ, where structures as barracks, war factories, and more are availeable. 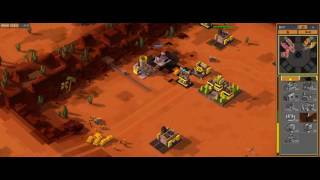 To defend the base there are two kinds of turrets at your disposal that shoot at air or ground units. Should your HQ get destroyed in multi player, you can build a new one at any time with the necessary resources. 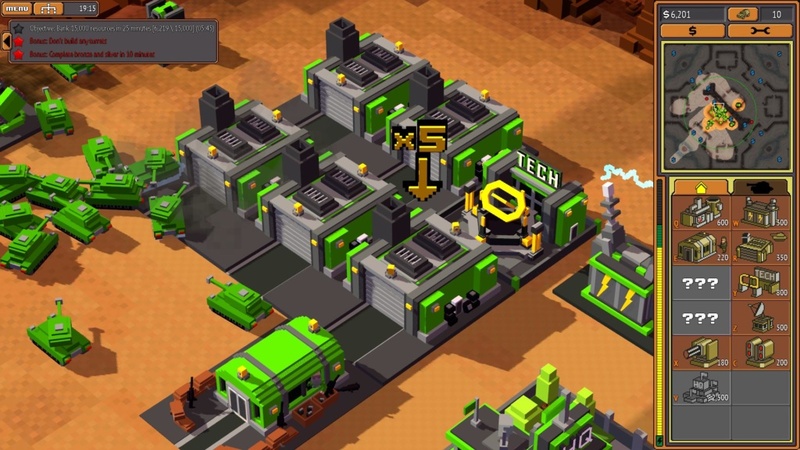 This is one of the biggest differences to ‚Command & Conquer‘ and enables players to rebuild a new base and – with a little luck – to recover completely. Unfortunately the only availeable language in ‚8-Bit Armies‘ is English, there is no German version. You can cope with that though, as the mission briefings are understandable and clearly structured. The voice output that can be heard during the game is also English, e.g. when your base is under attack. As in ‚Command & Conquer‚, the number of facilities of one kind that you have raises your production. I.e. the more war factories you have, the faster a tank can be produced. From about six to eight factories things get really quick and your factories spill out one vehicle a second – if you have the money. There are not only tanks, infantry, and helicopters in ‚8-Bit Armies‚ to crush your enemies but of course also super weapons. Namely the nuclear bomb as well as the ion cannon. 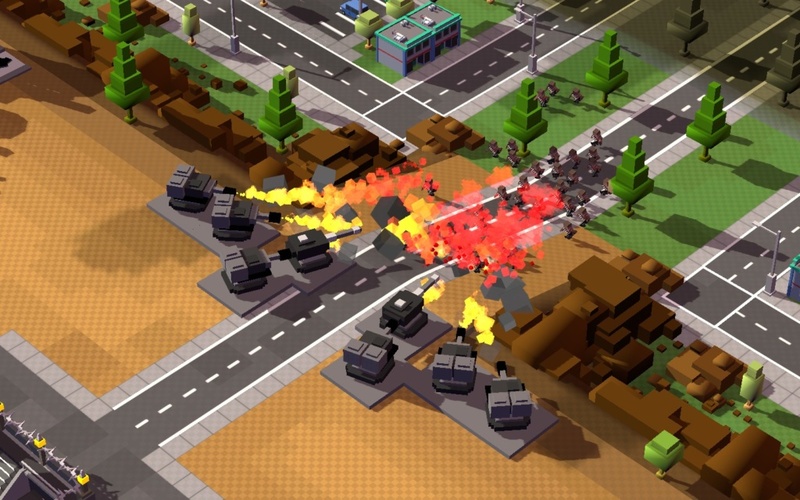 In ‚8-Bit Armies‘ almost all objects are destroyable. Not just trees can be mowed down but also can buildings be flattened to the ground. 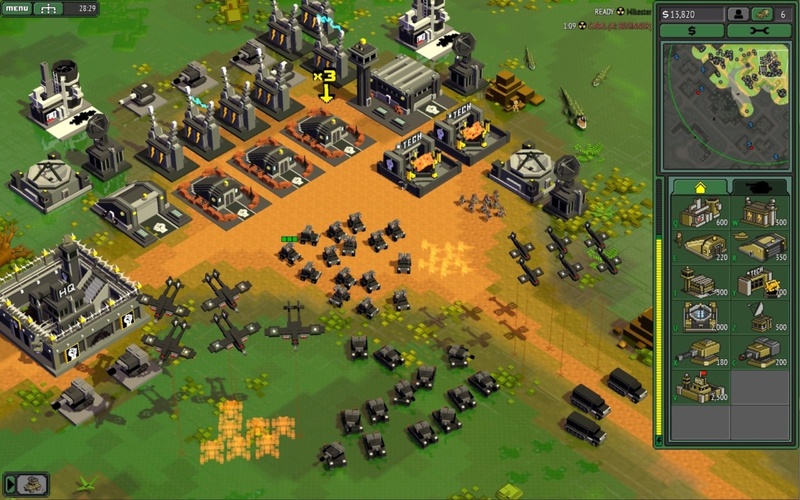 Who knows ‚Command & Conquer‘ will easily find his way around in ‚8-Bit Armies. There are some little differences to ‚Command & Conquer‘ though, as the amount of super weapons for example. The more super weapons you build, the quicker their timer counts down until you can launch one. Of course,there are also engineers in ‚8-Bit Armies‚. Although they do not repair buildings but vehicles and infantry and even aerial units. Engineers are also lightly armed. Nothing to exciting, but at least they can defend themselves and are not just fair game. Unfortunately the cannot capture buildings. 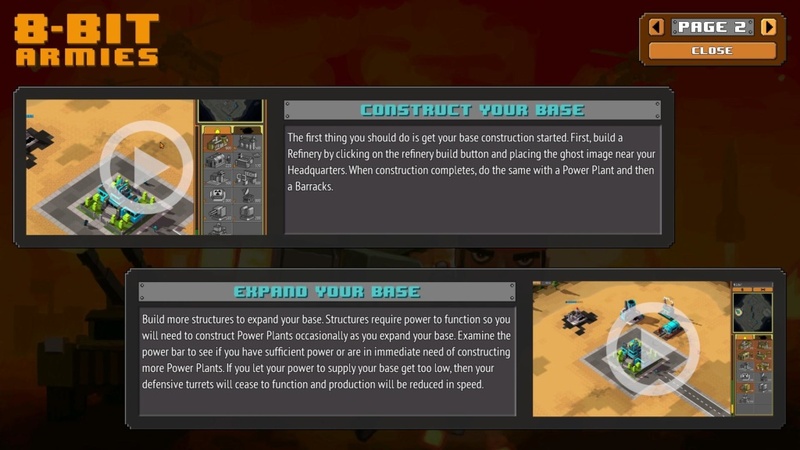 On the other hand buildings can be repaired just as in ‚Command & Conquer‘ by clicking on a tool icon. In contrast to ‚Command & Conquer‚, in ‚8-Bit Armies‚ you have to rely more on quantity, i.e. as many units as possible, preferably mixed well. An exception from that are guerilla attacks. E.g. with a hand full of helicopters you can easily throw your enemy a curve. There are many more appealing tactics though. You might want to load a task force of tanks into transport helicopters and to attack the back of your enemy’s base where his blind side is. By the way, there are also crates in ‚8-Bit Armies‚ as you know them from ‚Command & Conquer‚. 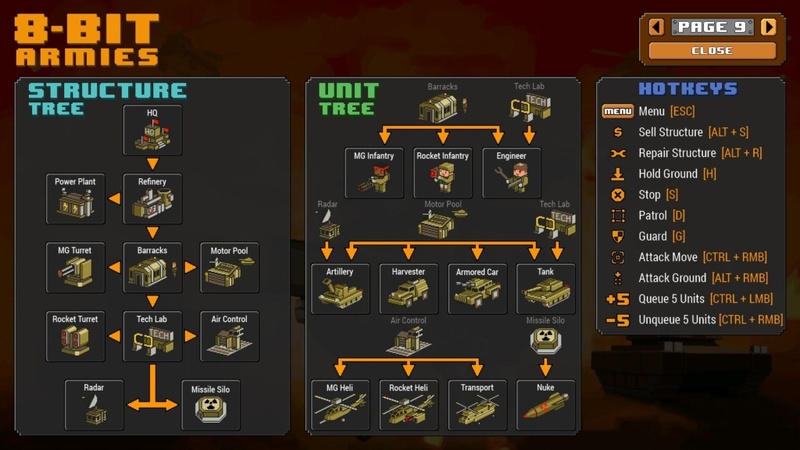 There are no unit promotions or upgrades inside of them but rather new units themselves. Everything goes here, from harvester to heavy tanks. So picking up those crates usually pays out. However, in this game only infantry units can open crates. I think this is very good, as you have to move some infantry to the crates first. So, who mixes his units well gains an advantage. If the resources on the map are depleted there are no more supplies. That means you have to economize with your resources and use them strategically. Who is afraid of a unit cap does not need to worry about ‚8-Bit Armies‚, because there is none. Disadvantages of this can only show in multi player mode where little lags may occur when huge amounts of units are on their way. The cool retro graphics of ‚8-Bit Armies‚ most remind me of ‚MineCraft‚, although the perspective is of course different. The toy-blocks-look sure is appealing, the explosions are well done, too and the maps appear neatly. However, the choice of music is not particularly big, but sufficient. From time to time I found myself humming Frank’s music… some real earworms! The single player mode of ‚8-Bit Armies‚ is quite good. There is indeed no great introduction as you are used to from ‚Command & Conquer‚, but the missions are interesting. The targets are not too various, though. Usually you have to destroy the enemy’s HQ and who wants the bonus points has to deal with it within a certain amount of time. DLCs for additional campaigns are scheduled, so we can be very excited about what ‚Petroglyph‘ is going to come up with. The difficulty level raises with each mission. Those who could use some help with one mission can also face it in coop mode. This option is not availeable for all missions, though. The multi player mode of ‚8-Bit Armies‚ turned out beautifull and runs stable. Sometimes the game lagged for a few moments. But this can be ascribed to the masses of units that are moved during an 8-player-match. 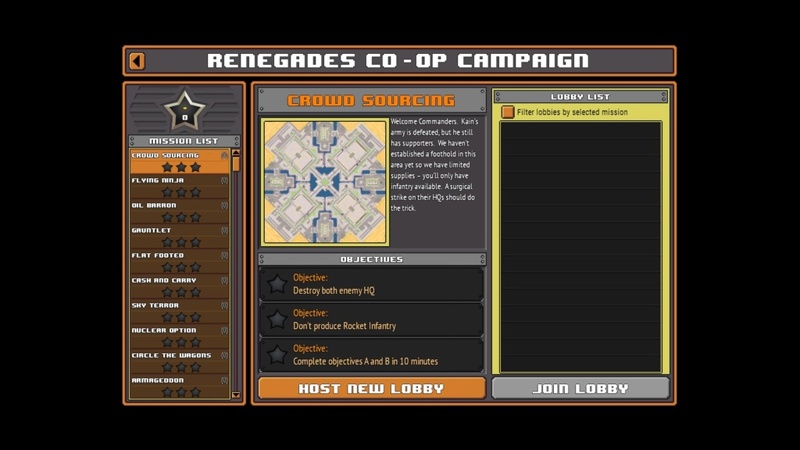 We experienced no connection time outs during our test and especially the new ‚Guardians‘ faction lately allows for more diversity in ‚8-Bit Armies’s multi player mode. The amount of multi player maps to choose from could be bigger, as it is quite limited. The multi player gameplay is a lot of fun. I really like the possibility to support a partner with resources. 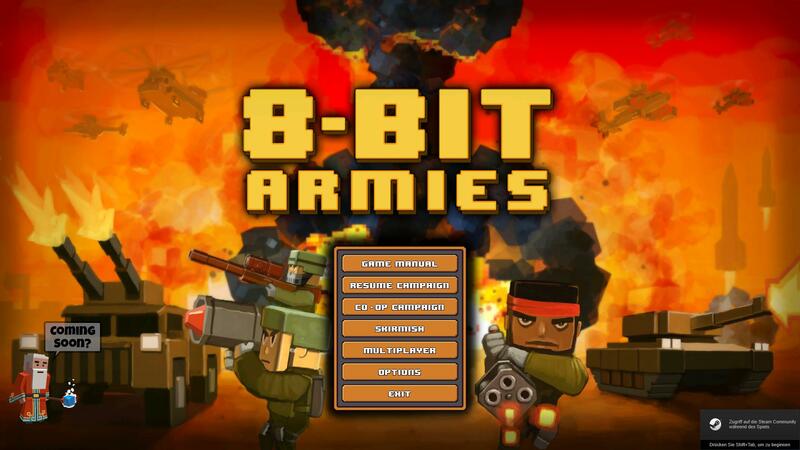 Of course there is a skirmish mode in ‚8-Bit Armies‚ in which you can battle the AI. Here as well, you can choose the new ‚Guardians‘ faction. 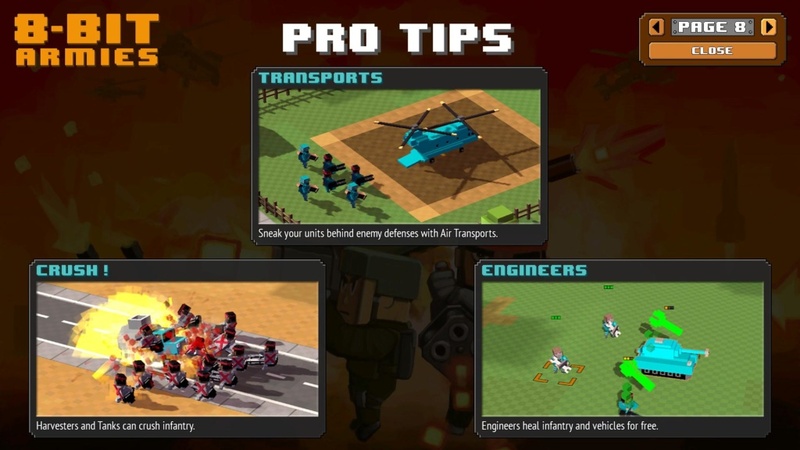 There are lots of tricks for newbies on how to play ‚8-Bit Armies‚ and there is also a short tutorial to play. 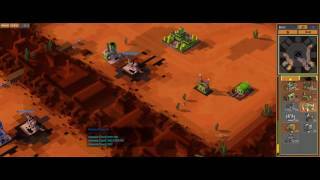 Here you can find all videos from the let’s play of ‚8-Bit Armies beta‘ for PC from operation 1 to 25, as well as some multi player matches. You cannot see the new faction here, as it released after the videos were made. 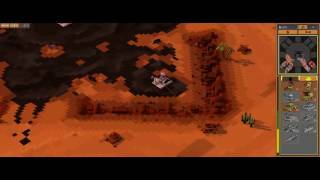 With ‚8-Bit Armies‚ ‚Petroglyph‚ released a really beautyful RTS game. The price of 15€ is more than fair and you get a lot for your money. To me ‚8-Bit Armies‚ was a lot of fun and I liked to play the missions. It espacially made me happy that ‚Petroglyph‚ further enhanced the game, what – thanks to the new faction – makes the multi player mode more versatile and in the future there sure is more to come. 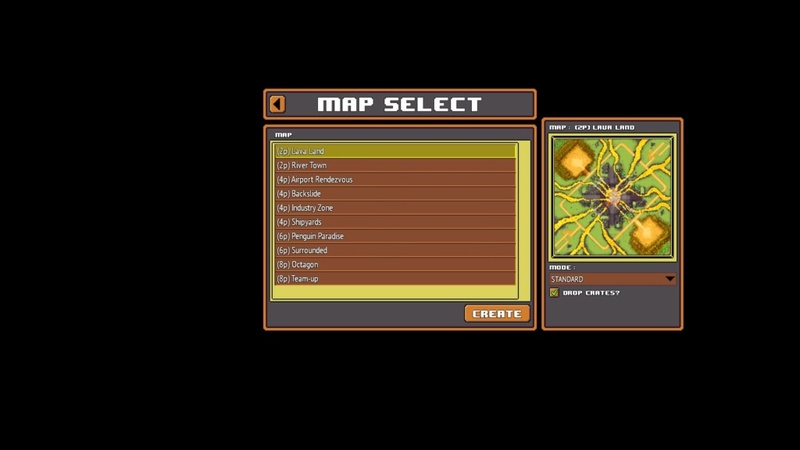 Furthermore, a map editor for ‚8-Bit Armies‘ was released as well as a charged DLC with a seperate campaign. Just great, how ‚Petroglyph‘ cares for the gamers. 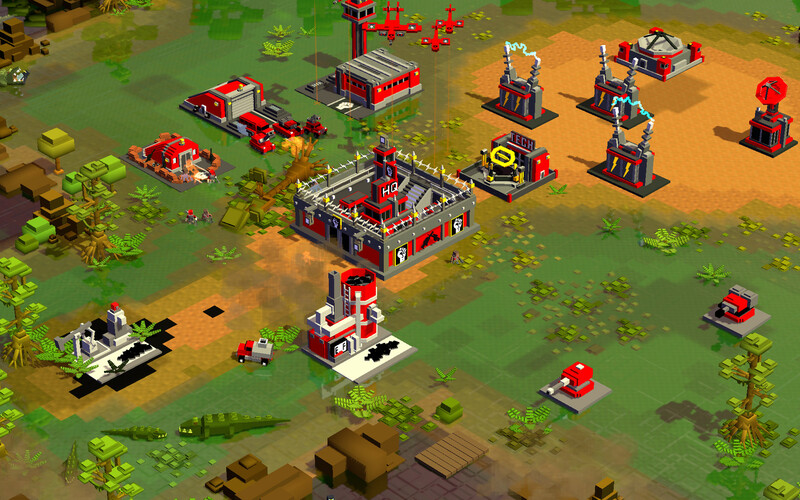 While playing, I sometimes forgot that I was not playing a ‚Command & Conquer‚ but ‚8-Bit Armies‚. 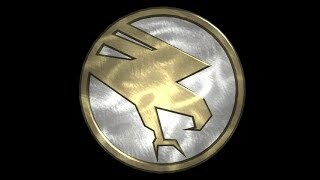 The flair is so similar to the original ‚Command & Conquer Tibarian Dawn‚. And while the game is so similar, it is still different and absolutely brilliant. The game is top notch, I have to recommend it. 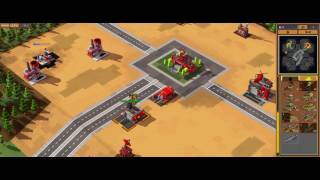 Who likes RTS will surely like ‚8-Bit Armies‚ and who is missing ‚Command & Conquer‚ will fall in love with it. Lange habe ich als Command & Conquer Fan auf einen neuen Echtzeit-Strategiespiel Titel gewartet, die Überraschung war groß, als Petroglyph ihr neustes Meisterwerk 8-Bit Armies ankündigten und natürlich war meine Neugier geweckt und so schaute ich mir das Spiel genauer an. Natürlich ist 8-Bit Armies kein Command & Conquer, aber es kommt diesem Franchise doch sehr nahe und dürfte daher besonders Command & Conquer Fans ansprechen, die von Electronic Arts bisher im Stich gelassen wurden. Aufgrund der recht überschaubaren Anzahl von Einheiten und Gebäuden, die der Spieler produzieren kann, ist 8-Bit Armies besonders für Genre Einsteiger geeignet, zwar kommen noch neue Fraktionen zu, doch überschaubar bleibt es alle mal. Petroglyph bietet in 8-Bit Armies mit rund 25 Singleplayer Kampagnen und 19 Coop Missionen, sowie einen Multiplayer Modus mit einer schicken Bauklötzchen Grafik für nur etwa 15 Euro im STEAM an. 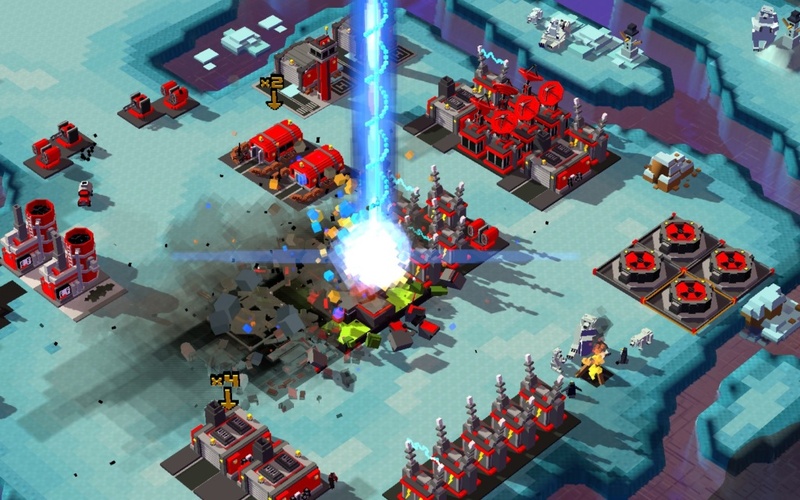 Im Multiplayer und Skirmish Modus von 8-Bit Armies sind etwa 10 Maps vorhanden, in denen bis zu 8 Spieler oder KI’s Platz finden. Wie in Command & Conquer könnt Ihr in 8-Bit Armies eure Basis mit einem HQ Aufbauen, hier stehen Gebäude wie eine Kaserne, Fahrzeugfabrik und mehr zur Auswahl. Um die Basis zu verteidigen stehen euch zwei arten von Geschütztürmen zur Verfügung, die gegen Luft und Bodeneinheiten feuern. 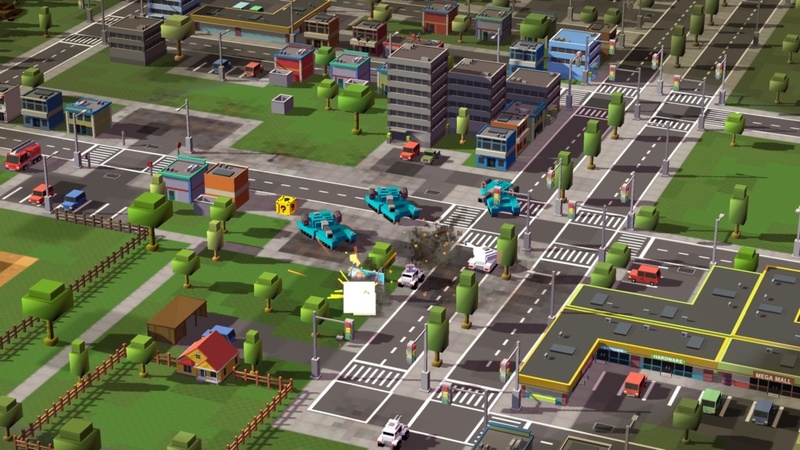 Sollte euer HQ im Multiplayer zerstört werden, könnt Ihr jederzeit mit den nötigen Ressourcen ein neues HQ bauen, dass ist einer der größten Unterschiede zu Command & Conquer und ermöglichst auch Spieler sich in einer anderen Basis aufzubauen, mit etwas Glück kann man sich wieder erholen. Die Sprache in 8-Bit Armies ist leider nur in Englisch, eine Deutsche Version sucht man vergebens, allerdings ist das auch hier zu verkraften, die Missionsbriefing ist verständlich und klar Strukturiert. Die Sprachausgabe ist ebenfalls in Englisch, die während des Spiels zu hören ist, z.B wenn Basis Gebäude angegriffen werden. Wie bei Command & Conquer erhöht die Anzahl der Gebäude, eure Produktion, d.h je mehr Fahrzeugfabriken Ihr habt, desto schneller werden beispielsweise Panzer von der Fahrzeugfabrik produziert, ab ca. 6 – 8 Fabriken geht das auch recht zügig und im Sekundentakt kommen bei dem nötigen Kapital entsprechende Fahrzeuge aus der Fabrik. Natürlich gibt es in 8-Bit Armies nicht nur Panzer, Infanterie und Helikopter, sondern auch Superwaffen um eure Gegner zu zerstören. Neben der Atombombe gibt es noch eine Ion Cannon. in 8-Bit Armies sind außerdem fast alle Objekte zerstörbar, so lassen sich nicht nur Bäume zerstören, sondern auch Gebäude werden dem Erdboden gleichgemacht. Wer Command & Conquer kennt, der wird sich in 8-Bit Armies sehr schnell zurecht finden, einige kleine Unterschiede zu Command & Conquer gibt es allerdings schon, wie beispielsweise die Anzahl der Superwaffen, je mehr Superwaffen gebaut werden, desto schneller läuft der Countdown ab, um die Superwaffe abzufeuern. In 8-Bit Armies gibt es natürlich auch Ingenieure, diese reparieren allerdings keine Gebäude, sondern Fahrzeuge und Infanterie, ja auch Lufteinheiten werden repariert. Gebäude können jedoch keine eingenommen werden und Ingenieure sind auch leicht bewaffnet, nichts wildes, aber Sie können sich zumindest verteidigen und sind kein Freiwild. Gebäude werden dagegen wie bei Command & Conquer über ein Werkzeug Icon Repariert. 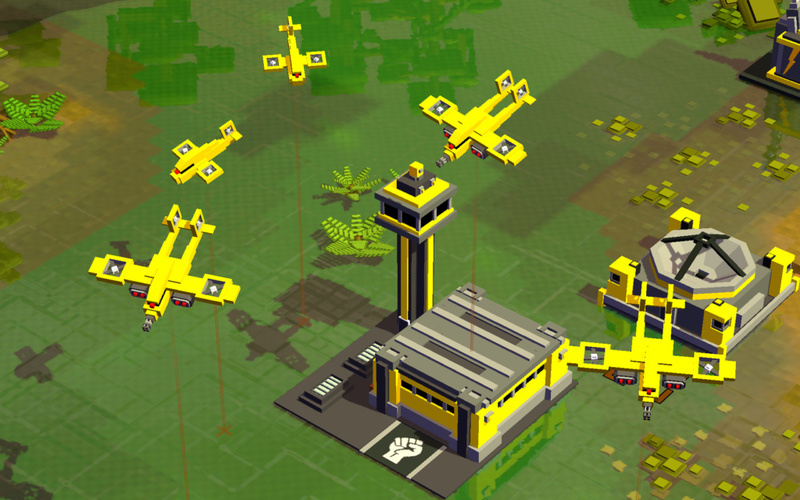 Im Gegensatz zu Command & Conquer muss man in 8-Bit Armies mehr auf die Masse setzen, d.h möglichst viele Einheiten und am besten wild gemischt, Ausnahmen stellen guerilla Angriffe dar, beispielsweise mit einer Handvoll Helikopter kann man den Gegner schnell aus der Ruhe bringen. Es bieten sich aber auch andere Taktiken an, wie beispielsweise eine Handvoll Panzer in Transport Helikopter zu laden, so kann man beispielsweise auch von hinten in die Basis einfallen, die dort meist deutlich angreifbarer ist und einen toten Winkel hat. Übrigens gibt es in 8-Bit Armies auch Kisten, wie man es von Command & Conquer kennt, jedoch erhalten die Kisten keine Beförderung von Einheiten, sondern viel mehr neue Einheiten, hier ist alles möglich, von Sammler, Gepanzerte Fahrzeuge, Panzer , Infanterie, bis hin zu Helikopter ist alles in den Kisten enthalten, der Griff zur Kiste lohnt sich daher in der Regel immer. Hier können allerdings nur Infanterie Einheiten die Kisten öffnen, ich finde das auch sehr gut, so muss man erst mal die Infanterie Einheiten zu den Kisten bewegen um auch einen Vorteil zu haben, wer Einheiten mischt, hat im besten Fall auch Infanterie Einheiten dabei. Sind die Ressourcen auf der Karte aufgebraucht, gibt es auch keinen Nachschub mehr, d.h Ihr müsst mit den Ressourcen entsprechend haushalten und diese Strategisch einsetzen. Wer sich sorgen um das Einheiten Limit macht, der kann bei 8-Bit Armies unbesorgt sein, es gibt nämlich keines. Nachteile bringt das nur im Multiplayer Modus, wo es dann doch mal kurzzeitig laggen kann, wenn sich die Massen an Einheiten bewegen. Die Coole Retro Grafik von 8-Bit Armies erinnert mich am meisten an MineCraft, die Perspektive ist natürlich anders, die Bauklötzchengrafik schaut jedenfalls sehr ansprechend aus, die Explosionen sind ebenfalls gut gemacht und die Karten machen auch einen guten Eindruck und sind ansprechend gestaltet. So stehen nicht nur die Standard Karten zur Auswahl, sondern auch Winterkarten, Wüstenkarten und sogar eine Vulkankarten, die sehr ansprechend geworden sind. 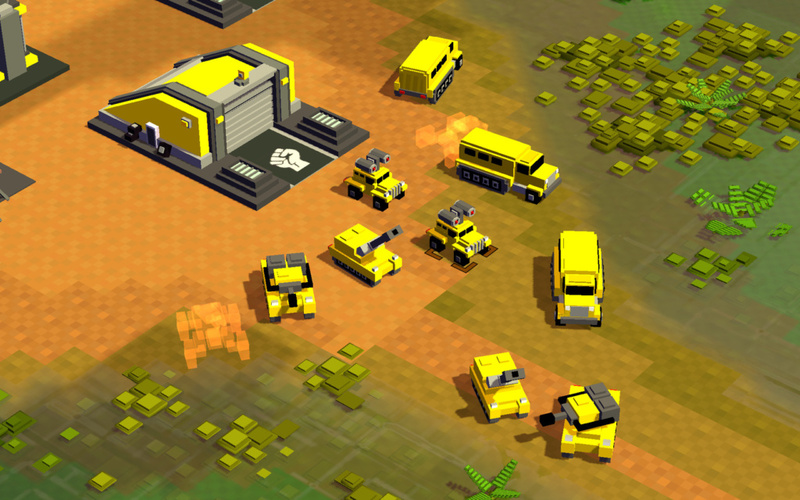 Der Einzelspielermodus von 8-Bit Armies ist durchaus gelungen, es gibt zwar keine tolle Einleitung wie man es von Command & Conquer gewöhnt ist, jedoch sind die Missionen recht ansprechend, die Missionsziele unterscheiden sich jedoch nicht großartig, man muss meistens die gegnerischen HQ’s zerstören und wer die Bonuspunkte möchte, muss das ganze innerhalb einer bestimmten Zeit erfolgreich abgeschlossen haben. Weitere DLC’s sind für zusätzliche Kampagnen geplant, wir dürfen als sehr gespannt sein was Petroglyph für uns noch schönes zaubert. Der Schwierigkeitsgrad steigt mit jeder Mission an, wer Hilfe bei einer Mission benötigt kann das ganze auch im Coop Modus mit jemanden bestreiten, hier stehen allerdings nicht alle Missionen zur Auswahl. Der Mehrspielermodus von 8-Bit Armies ist schön geworden und läuft auch soweit stabil. Manchmal gab es aber schon einige Minuten, in denen das Spiel sehr gelaggt hat, dass ist aber auf die massen an Einheiten zurück zu führen, die in einem 8 Player Spiel bewegt werden. Verbindungsabbrüche hatten wir während unserer Test keine und besonders die neue Fraktion „Guardians“ lässt im Multiplayer seit kurzem mehr Abwechslung in 8-Bit Armies zu. Die Auswahl von Mehrspielerkarten könnte in 8-Bit Armies durchaus größer sein, da diese doch sehr limitiert ist. Das Gameplay im Multiplayer macht viel Spass, besonders schön sind beispielsweise auch die Möglichkeiten einem Mitspieler mit Ressourcen zu unterstützen. In 8-Bit Armies gibt es natürlich auch einen Skirmish Modus, in dem Ihr gegen die KI’s antreten könnt, hier steht auch die neue Fraktion „Guardians“ zur Auswahl. Bei 8-Bit Armies gibt es für Einsteiger etliche Tipps, wie 8-Bit Armies zu spielen ist, außerdem gibt es noch ein kurzes Tutorial zum spielen. Hier findet Ihr alle Videos aus dem Let’s Play von der 8-Bit Armies Beta für den PC, von Operation 1 bis Operation 25, sowie einige Multiplayer Matches, hier ist noch nicht die neue Fraktion zu sehen, diese ist erst nach dem Let’s Play dazu gekommen. 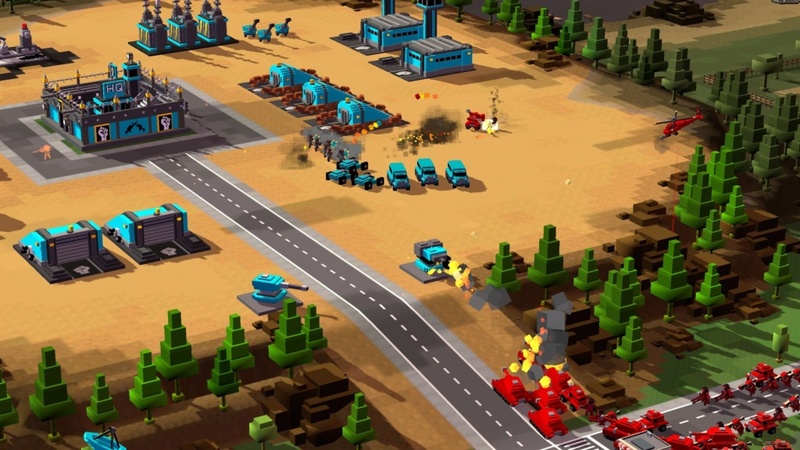 Mit 8-Bit Armies hat Petroglyph ein wirklich schönes RTS Spiel auf den Markt geworfen, der Preis von 15 Euro ist ebenfalls mehr als Fair und es wird einiges für wenig Geld geboten. Mir hat 8-Bit Armies sehr viel Spass gemacht und ich habe die Missionen auch gerne gespielt. Besonders freut es mich, dass Petroglyph das Spiel weiter aufgewertet hat, so wird der Multiplayer dank neuer Fraktion abwechslungsreicher und in Zukunft wird sicher noch mehr folgen. Außerdem wurde ein Karten Editor für 8-Bit Armies veröffentlicht und auch ein kostenpflichtiger DLC mit einer Separaten Kampagne wurde kürzlich veröffentlicht. Einfach klasse, wie hier Petrogylph sich um die Gamer kümmert. Während dem Spielen hatte ich manchmal ganz vergessen, dass ich kein C&C Spiele, sondern 8-Bit Armies, zu ähnlich ist der Flair zum ursprünglichen C&C Tiberian Dawn, dass Spielprinzip und alles ähnelt sich zwar, aber es ist trotzdem anders und absolut gelungen. Das Spiel ist absolute Klasse, ich kann es nur Empfehlen, wer Echtzeitstrategie mag, wird 8-Bit Armies sicher schnell ins Herz schließen und wer C&C vermisst, wird 8-Bit Armies lieben. 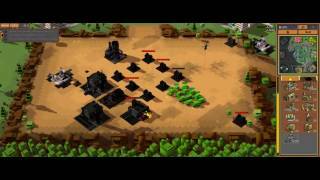 8-Bit Armies von Petroglyph, erneut ein 4vs4 Multiplayer Match auf der Karte „8P TEAM UP“ der Beta von 8-Bit Armies. 8-Bit Armies von Petroglyph und erneut ein 4vs4 Multiplayer Match auf der Karte „8P TEAM UP“ der Beta von 8-Bit Armies. 8-Bit Armies von Petroglyph. Nach dem der SinglePlayer mit 25 Missionen beendet wurde, hat mich natürlich auch der Multiplayer von 8-Bit Armies interessiert. Diesmal ein 2vs2 auf der Karte „4P AIRPORT RENDEZVOUS“ der Beta von 8-Bit Armies. 8-Bit Armies von Petroglyph. 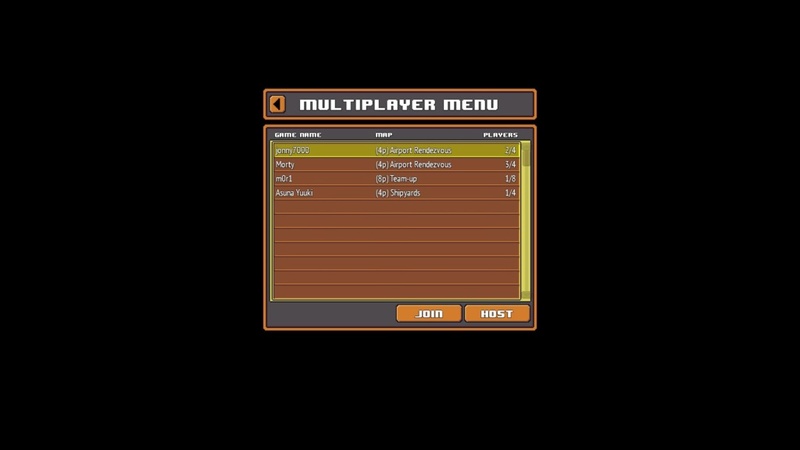 Nach dem der SinglePlayer mit 25 Missionen beendet wurde, hat mich natürlich auch der Multiplayer von 8-Bit Armies interessiert. Diesmal ein 4vs4 auf der Karte „8P TEAM UP“ der Beta von 8-Bit Armies. 8-Bit Armies von Petroglyph. In der 25igsten und Letzten Singleplayer Mission (EARTHQUAKE) der Beta von 8-Bit Armies gilt es alle feindlichen Gebäude, natürlich auch alle feindlichen Vereidigungs-Türme zu zerstören, also restlos alles von der Karte zu fegen. Wer noch die Bonuspunkte mitnehmen möchte, muss ordentlich gas geben, den weder Ihr, noch die verbündete KI darf ein Gebäude verlieren, dass betrifft auch Verteidigungs-Türme. Das Verkaufen von Gebäude ist genauso verboten und würde euch den Bonuspunkt kosten. Außerdem müsst Ihr die Mission in 25 Minuten erfolgreich beendet haben um auch den letzten Bonus zu erhalten. 8-Bit Armies von Petroglyph. In der 24igsten Mission (ACID RAIN) der Beta von 8-Bit Armies gilt es alle feindlichen HQ’s zu zerstören, dass verbündete HQ muss dabei aber überleben. Wer sich noch die Bonuspunkte sichern möchte, sollte alle Feindlichen Raketensilos zerstören und die ganze Mission innerhalb von 15 Minuten erfolgreich beenden.